Joy Reid is fanatically pro-abortion. But what of Ann Coulter? The answer might surprise you. But is she really pro-life? If so, why has she been at odds with the pro-life movement for fully two decades? In 2000, Coulter vilified GOP presidential candidate Gary Bauer and other pro-lifers who were seeking a constitutional remedy to abortion. Her essay was titled, “Must Christian conservatives be fascists?” Coulter’s purpose was to preserve George W. Bush’s candidacy from the wrath of the abortion industry. Ever since, Coulter has subordinated pro-life considerations to whatever matters she considers more immediate or more expedient. Coulter has, in fact, rejected many potential pro-life candidates for others she deemed more electable. Gradations? Coulter refuses to drawn the clear and distinct lines that science and scripture dictate: human life is human from the point of conception. Yet Ann (“I am totally pro-life”) Coulter continues to attack pro-lifers. Why would Ann, who often treats people out of the womb so callously, care about those who are still in the womb? 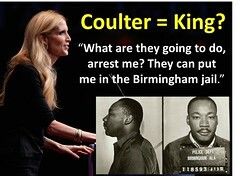 See “Coulter Dictates” at http://wp.me/p4jHFp-3E. 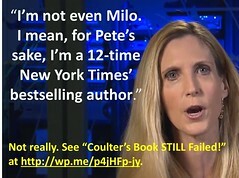 Ann Coulter, “Don’t Blame Romney,” 11/7/12. Ann Coulter tweet, 8/16,/5, 12:36 p.m.
 Ann Coulter, Mornings on the Mall, WMAL, 7/24/15.